How do you follow up one of the best Android tablets? 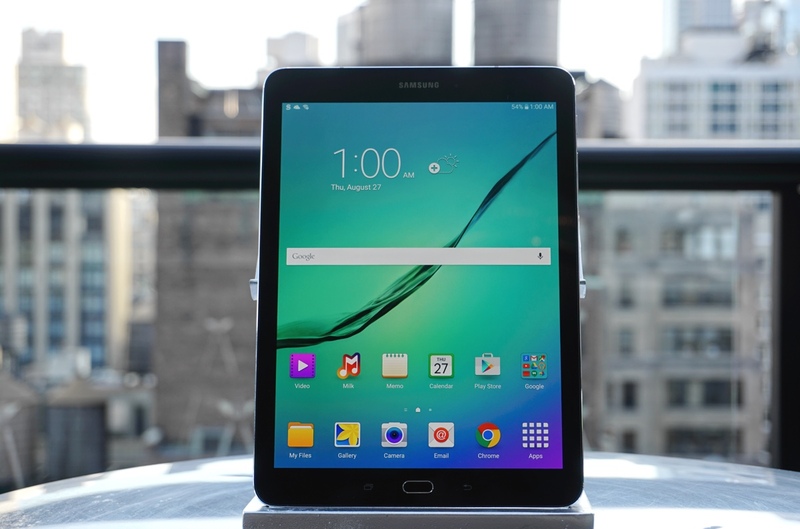 For Samsung, it's by taking a completely different direction with its new Galaxy Tab S2. We adored last year's model, primarily for its gorgeous quad HD display, and quite honestly, there wasn't much that tablet lacked. So instead of just upping the specs (which it also did), Samsung reframed the Galaxy Tab S2 with a square 4x3 aspect ratio, making it better suited for browsing the web and reading e-books. In a briefing with press today, Samsung reps said they found customers did plenty more than just watch movies with their tablets, so a different aspect ratio was more appropriate. They also mentioned wanting to "standardize" with the market and avoid fragmentation among tablet display formats, which seemed likely a thinly veiled nod to Apple's iPads, which all have 4x3 displays. So was the change worth it? After handling the Galaxy Tab S2 for a few minutes, I can't come up with a definitive answer yet. The new tablet certainly feels more comfortable than its widescreen predecessor, simply because it's easier to hold a square display than a rectangular screen with one hand. It's a tad thinner at 5.6 millimeters, and it's also lighter than the last model, clocking in at 0.87 pounds. It feels freakishly light for a tablet with a 9.7-inch screen. The iPad Air 2, in comparison, weighs 0.96 pounds. I can't imagine anyone can actually feel the difference between the two, but you can bet Samsung will take advantage of its bragging rights (until Apple inevitably debuts a lighter iPad Air 3). From my short time with it, the Galaxy Tab S2 doesn't seem like something owners of the previous Tab S should upgrade to, but it may be more compelling to everyone else. Samsung reworked its multitasking feature so that it now works more like the Galaxy Note phones. You can have several apps open at once on your screen — and, for the first time, you can also drag media and text between apps. So if there's a photo on the web you want to mail to someone, you can drag it into your email app without switching screens. While the multitasking feature was mainly relegated to Samsung apps over the past few years, the company says more third parties are adopting it as well. One of the reps was surprised to learn from a customer that Spotify now supports it, for example. Under the hood, the Galaxy Tab S2 is running a Samsung Exynos octa-core chip running at 1.9 GHz and 1.3 GHz, along with 3GB of RAM. It ships with 32GB of storage, but you can also slap in a 128GB memory card for a bit more space. The Tab S2 is running Android 5.1 Lollipop, and there's also a fingerprint sensor just like the company's recent smartphones. Among other new features, you can also shoot video from the Galaxy Tab S2 to compatible smart TVs (it'll work with sets from other manufacturers), and you can also pipe content from a modern Samsung smart TV to the tablet. The latter feature even allows you to turn your TV on and off remotely — perfect for when you want to finish that episode of Game of Thrones in bed. Pre-orders for the Galaxy Tab S2 kick off today, with the Wi-Fi 9.7-inch model going for $499, and the smaller 8-inch version going for $399. They'll officially start shipping on September 3. We've got a unit to test out, so check back for a deeper look.